I have this love affair with food, but I have known for quite some time, that I will have to reform some of my foodie ways and start making healthier versions of the things I love. I am getting older and I certainly don't want to grow horizontally. I decided to try making a cauliflower crust pizza to satisfy my hankering for ooey gooey cheesy pizza. It was a great success. It was tasty, and filling and cheesy and saucy and all the great things a pizza should be, so I thought I could make this pizza and trick my son into eating more vegetables by not telling him the crust was made with cauliflower. Me: "I have got a surprise for you!" Little Man: "What is it mom?" My son was really excited. Very excited. Little Man: "What did you make this with, it tastes like dead vegetables mixed with garlic. I need to help you next time mom, so I can see what you put in this stuff" "Stick with your original pizza recipe mom"
Okay, so for him, no es bueno, but I LOVED IT! Now, don't get it twisted, it does not taste 100% like the real thing, but it is pretty close and very very tasty and the cherry on top is that its healthy and low carb. This is a great way to eat healthy and still enjoy some of the bad stuff we aren't supposed to have. I really like stuff I'm not supposed to have, so finding ways to make things that are bad for me, good for me is a win win in my book. 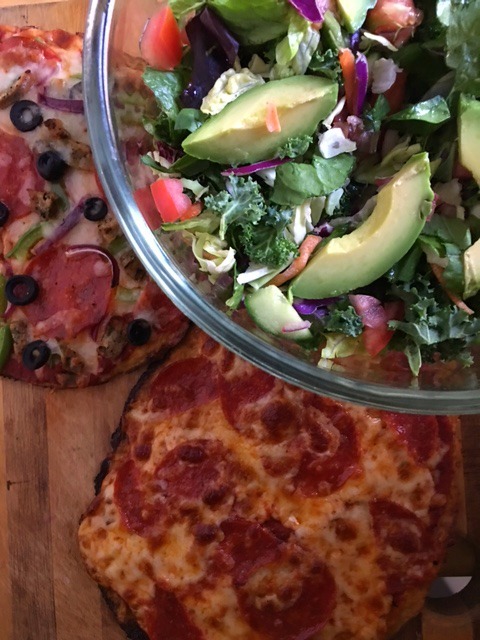 Are you ready to try some healthy pizza? You will need one head of fresh cauliflower. Put it in a food processor or use a cheese grater until it looks like snow. Microwave it for 5 minutes and then dump all of it in a towel and squeeze all of the water out of it. You must get as much of the water and moisture out of it as possible for your crust to turn out good. Your crust should be a nice golden brown in 15-20 minutes. The finished product was pretty delicious. I made two pizzas and customized the toppings, but you can also make one large pizza, just adjust the toppings if you choose to make one big pizza. 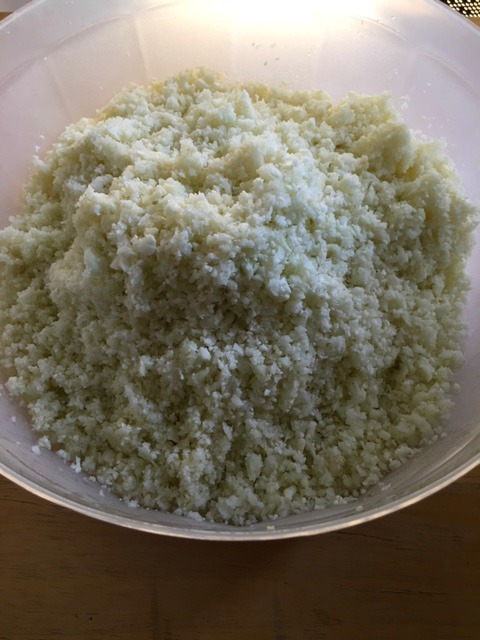 Put your cauliflower in a food processor and blend until it is the consistency of snow. (You can try using a cheese grater if you do not have a food processor). Put your cauliflower in a bowl and microwave for 5 minutes. Let it cool and wrap all of the cauliflower in a towel and squeeze all the water out of it. Once you have removed all the water from the cauliflower, put it in a dry bowl and mix in the spices, cheese and egg. You will end up with a cauliflower dough. Use a sheet of parchment paper and shape your dough into a round pizza, no bigger than your pan or pizza stone. Put parchment paper with the dough on it, onto the pan and bake 15-20 minutes until golden brown. Spread your pizza sauce on the crust, sprinkle the cheese and your other toppings and bake for 15-20 minutes. I love to have salad with pizza, so I made a chopped salad and garnished with fresh avocado. Perfect healthy and satisfying dinner. Who would have thought...cauliflower pizza dough! It sounds delicious and it looks easy to make. Must try! I've been wanting to try this but most of the photos I've seen floating around the web don't look very appetizing, however yours look delicious! You're son is too funny! Looks delicious! I love pizza! Lol - your son is too funny. Dead veggies mixed with garlic - ha! I've been seeing a lot of cauliflower crusted pizza recipes lately and I definitely will give it a try since I'm trying to be better about eating more veggies myself. Yours looks like a normal pizza so I'm bookmarking this post. Wow! I would have never thought that you could make pizza crust with cauliflower. I'd try this. I have never heard of using cauliflower in pizza crust, go figure. Your son sounds like my son. LOL!!! The pics look great, if I didn't know about the cauliflower, I would try it, too but I'm so not a veggie person. LOL! I have never heard of pizza like this. The pics look pretty yum although I'm unsure if I'm bold enough to give it a try though. This looks SO good. 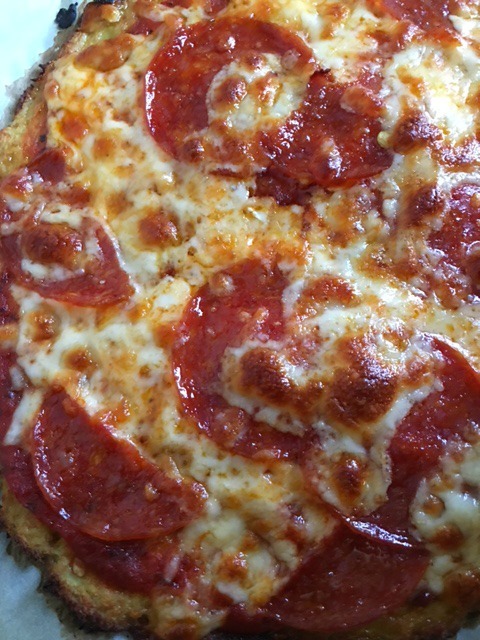 I've heard so many good things about cauliflower crust! You've inspired me to try it out. Ok I am seriously going to try this with the riced cauliflower I got fro Trader Joes! This looks so good and easy! Thanks for sharing! Wow, this looks bomb! I definitely need to bookmark this and try it one day. Thanks for sharing! Looks so yummy! Thanks for sharing this recipe! Yummy! Cauliflower crust is on my list of things to make this month. I love that cauliflower is do versatile. Wow! You totally have skills. Please mail a slice...haha. Thanks for sharing and check out our latest campaign by SICKY eyewear. Oh I am so trying this! I saw that target carries the crumbles cauliflower too. This looks absolutely amazing and I can't wait to try it.I'm also looking for healthier ways of eating my favorite foods so I'm excited to test this out! I'm intrigued! I may have to try this recipe now thaat I am working on getting in shape for the spring/summer. I made this once too, and the results were mixed. I certainly felt better about the nutritional content, but I usually load my pizzas with tons of veggies anyways so I'm just going to treat it as a treat. I wonder if some hybrid recipe (mixed of flour and cauliflower) is out there? Might be worth another shot! Dude this guy here at The Good Pizza, has gluten free.. BUT, I'm trying to see if he'll do this crust.. I tried doing it myself and I actually was impressed!